B y the time he had served five years for armed robbery, Mark had lost 80 pounds. He had developed a new tic — tightly closing his eyes, as if blinking back bad thoughts. But the biggest change, his mother said, was in his face. It had hardened. A deep crease ran along the bridge of his nose. This story was reported in partnership between NPR News Investigations and The Marshall Project. Read more of this investigation: Part 1, Part 2. Mark was not approved for parole while in segregation. As in many states, parole boards in Texas consider inmates’ disciplinary histories when deciding whether to release them early. Instead, he “maxed out” and served his full five-year sentence (the first half in a juvenile detention facility), which meant he had no parole officer supervising his return to society. On the bright July morning he was sent home, prison guards removed Mark’s shackles, handed him a check, and let him go. Like many released straight from solitary, he would soon be back. Sara Garcia with Mark on the day of his release from solitary and prison in July 2014. Every year, prisons across the country send thousands of people directly from solitary confinement back into their communities. An investigation by The Marshall Project and NPR found that 24 states released more than 10,000 people1 from solitary last year. The actual total is higher, as 26 states and the federal Bureau of Prisons could not say how often it happens. These individuals go from complete isolation one day to complete freedom the next, yet they are in many ways the least equipped to make the transition home. Inside prison, those in solitary — many of whom suffer from mental illnesses that were either triggered or exacerbated in segregation — often cannot participate in the classes or services offered to other inmates approaching their release date. And in several states once those inmates in solitary are freed, they are more likely to be released without the help of a probation or parole officer. Those who make the jarring leap from solitary to the streets can easily end up jobless, homeless — or back in prison. Or worse. Last week, 22-year-old Kalief Browder committed suicide two years after coming home from New York City’s Rikers Island jail, where he had spent nearly all of the previous 17 months in isolation. Browder received national attention after a 2014 New Yorker profile detailed the horrific three years he languished in jail awaiting trial for charges that were ultimately dismissed. His family said Browder deteriorated during his time in solitary, where he twice tried to kill himself. He remained there until the day he was sent home. In Mark’s home state of Texas, 1,174 prisoners were freed straight out of administrative segregation — prison jargon for solitary units housing suspected gang members or others deemed a threat to prison security — in fiscal year 2014. More than 60 percent of them emerged without any supervision, compared to only 14 percent of other prisoners released that year. Prisoners who go straight to the street pose a danger to public safety. Analysts for the Texas Legislative Budget Board found that more than 60 percent of state prisoners released from solitary were rearrested within three years, compared with 49 percent of overall prison releases. Similar studies in Washington and California found people coming out of segregation cells had recidivism rates as much as 35 percent higher than those leaving the general population. When Mark emerged from the brick building known as “The Walls,” Garcia ran towards him. He was wearing clothes the prison collected from church donations: wrinkled grey slacks and a peach button-down several sizes too big. Mark squinted and tripped over his own feet as he walked toward her. Still, she felt relieved. Okay, the nightmare is over, she thought. M ark had battled mental illness and developmental problems for much of his life. In preschool, he was placed in special education classes to help with his speech impediment and difficulty reading. He was diagnosed in his teens with schizoaffective disorder, emotional disturbance, and mild mental retardation. Garcia always knew Mark was “different,” but it wasn’t until middle school that the true severity of his disabilities became clear. He grew aggressive, one time shoving a teacher. After that incident, he was sentenced to nine months of probation. Mark always looked older and acted younger than his true age. When he was 14, he weighed 250 pounds but had the intellectual capacity of a six-year-old, by some psychological measures. The combination made him an able bodyguard for his special education classmates when they were teased by other students — but also someone who could be easily manipulated, Garcia said. Mark was arrested at 14 for a string of armed robberies — including a gas station, a pizza parlor, and a dollar store — over a two-week period in McAllen, Texas, where he was living with his father. Mark and his family claimed his older cousins got him drunk and stoned, handed him a gun, and sent him into stores while they waited in the car. Prosecutors said he acted alone. After nearly two years of legal proceedings, Mark took a plea deal for five years in prison. He would be held at juvenile detention facilities until he turned 18. Garcia with Mark in 2009. Instead, Mark was soon moved to a maximum-security adult prison, the Telford Unit in New Boston, Texas. And within six months, he landed in a segregation cell for allegedly threatening to escape. During their monthly, no-contact visits, Garcia saw Mark’s behavior change. He began swearing at her, flipping her off, and telling her not to come. “He wasn’t like that when he went in,” she said. She tried to pacify him by recalling happier times — their yearly trips to Disney World, the birthday parties she threw for him. But Mark could not remember any of it. Research indicates that people with mental illness are more vulnerable to the trauma of isolation. In a 2014 study of the use of solitary in Mississippi, psychiatrist Terry Kupers found that what begins as a minor psychiatric issue could devolve into full-blown psychosis within the confines of a segregation cell. “Prisoners prone to psychotic episodes will predictably have a ‘breakdown’ triggered by the stark isolation and idleness of segregation, and prisoners prone to despair, self-harm, and suicide will tend to have crises and harm themselves,” Kupers wrote. As of March 31, inmates receiving mental health care made up 17 percent of the Texas corrections population, but 27 percent of the inmates in isolated in administrative segregation cells. A spokesperson for the Texas Department of Criminal Justice, Robert Hurst, said that mentally ill offenders released under supervision are referred to mental health providers in the community. But those who max out their sentences are just given a directory with contact information for different mental health services. Mark’s family claims he came home without even a prescription for psychiatric medication. Brian Nelson, who was convicted of murder and armed robbery at the age of 17, went into solitary in an Illinois supermax prison with no diagnosed mental illness. He spent the last 12 years of his 28-year sentence in isolation. “I never had mental health issues before. I never saw a psychiatrist. I never took psychotropic medication,” said Nelson, who was released in 2010. He ended up with multiple prescriptions for his “major depressive illness” and a sleep aid, according to a lawsuit. “I understand getting beat up. I don’t understand what them walls did to my head,” he said. Talking about his time in solitary still triggers flashbacks: of pacing like “an animal in the zoo” until large blood blisters erupted on the soles of his feet; of jumping off his bed in an attempt to break his neck on the cement shelf in his cell. (The shelf broke.) He is not alone: a 2014 study on self-harm and segregation found that “inmates punished by solitary confinement were approximately 6.9 times as likely to commit acts of self-harm,” after controlling for other variables. Nelson is now the prisoners’ rights coordinator for the Uptown People’s Law Center, a legal nonprofit in Chicago, where he corresponds with Illinois inmates and investigates their complaints. At first he worked in an office he and his colleagues called “the cell”: a small, windowless room that held only his desk, chair, and a bookshelf of dusty legal volumes. “He was very comfortable there, so we didn’t push him to move,” said his boss, Alan Mills, executive director of the UPLC. The 20 or so other men Nelson knows from supermax have had an even harder time adjusting. “All of us have a basement, somewhere we can hide,” he said. “They come out at night,” when there aren’t as many people around. Very few have jobs. Most live off their families or receive disability benefits. Finding and maintaining employment is a challenge for anyone who has spent time in prison, in part because so few employers are willing to hire people with criminal records. But those who have returned from solitary confinement said finding work was even more difficult after spending years in isolation. While prisoners in the general population may be able to work within the facility or take classes that teach them a trade, people in solitary generally cannot. Mark’s uncle, Rolando Garcia, who took courses during his time in federal prison, said his nephew came out unequipped for most entry-level positions. “He didn’t know how to use his hands,” Rolando said. He tried to teach Mark basic carpentry and mechanical skills. University of Arizona anthropologist Dr. Brackette Williams has studied how long stints in segregation affect reentry. In her 2012 research, she met with 44 people coming home after spending time in solitary, most of whom ended up unemployed and homeless. Some slept under the open sky of the Tucson desert. Others sought smaller spaces, like the Phoenix woman who could only fall asleep in a phone booth. The prospect of sleeping in a dormitory-style shelter alongside dozens of strangers was often too much for those who had spent years by themselves. “To them, going to the shelter was another prison,” Williams said. A fter his release, Mark rarely left the one-story bungalow he shared with his father on Austin’s gentrifying east side. His mother would drive up and find him sitting alone on a lawn chair on the front porch, holding one of the many beers she said he drank every day. Other times, he could be found in his room, furnished with little more than a twin bed and a dresser. The walls were blank, the windows covered with cardboard and duct tape while his father renovated the house. Mark spent his time either pacing from one wall to the other or sitting and glaring at himself in the mirror. “I don’t know what he saw,” Fernando said. One afternoon, as Garcia was parking the car at their local grocery store, Mark asked her to buy him a case of beer. When she said no, he started screaming expletives and threatened to bash her head in with a hammer. Garcia got out of the car and called her brothers for help. Mark, fearing the wrath of his uncles, took off running through the parking lot. Garcia had to call a mental health crisis center to help her coax him back home. One of Mark's psychiatric evaluations. Garcia was used to seeing people change after being kept in isolation. Her younger brother, Rene Garcia, had returned from four years in solitary in 2012 after he was arrested for stealing a car. Rene claims he was a former gang member at the time of his arrest, and he spent his entire prison sentence in segregation, he said, as prisons routinely separate gang members from the general population for security. Mark’s family said that all they were given to support his transition home was a charity’s pamphlet about reentry in the prison waiting room. Garcia took time off from her two part-time jobs to try and get him into counseling, job training, and on food stamps. Mark needed a job where he wouldn’t have to interact with people. But he had never worked — having been incarcerated since he was 16 — and had not used a computer in over two years. Garcia eventually found Mark a job power-washing oil rigs with a cousin in Oklahoma. His first weekend there, Mark got drunk. His coworkers heard him talking to himself. After three weeks on the job, he was fired. D uring a 2012 state senate hearing on the use of segregation, advocates and lawmakers criticized the Texas Department of Criminal Justice for not better preparing prisoners for release. “Over-reliance on the isolating and restrictive qualities of administrative segregation is dangerous for inmates, staff, and the public,” wrote Travis Leete, then a policy attorney for the liberal think tank Texas Criminal Justice Coalition, in his testimony. Leete noted that hundreds were coming out directly from segregation cells in Texas prisons without any supervision. "That's scary. We need to review this whole process," said committee chairman John Whitmire in response to the numbers. “Why not give them some life skills or some faith-based programs…that can prepare them for when they get out, rather than just turning them loose?" Texas has since expanded programs created in 2004 and 2012 that provide classes on life skills and anger management to some in administrative segregation as they approach the end of their sentence. “There is no required out-of-cell programming…. Offenders do have opportunities for out-of-cell activities such as phone calls from the office, meetings with staff and visitation,” said TDCJ spokesperson Robert Hurst, in an email. Many of the courses are administered through in-cell computers. In fiscal year 2014, 710 Texas prisoners in segregation were provided such programs — but hundreds more were not. Hurst noted that there are several other programs targeted at prisoners in administrative segregation with a mental illness. Many states have developed similar initiatives. The Washington Department of Corrections created a nine-month “Intensive Treatment Program” to gradually increase prisoners’ abilities to interact with others, or, as supervisor Steve Blakeman put it, “staged socialization.” Participants begin the program sitting in a six-person classroom where each student is restrained in his chair. By the end of nine months, they are free to roam the yard among teachers and other inmates. Several states, including California, South Carolina and Louisiana, have created “step-down” programs that allow people in solitary to earn their transition to the general population through good behavior or renouncing gang membership. In 2012, 188 Colorado prisoners came home directly from administrative segregation. Since March 2014, there have been zero. Inmates who are 180 days away from being released from segregation are now placed in a step-down program that connects them with case managers and mental health staff that help them adjust to social interaction. Fewer prisoners are also being placed in solitary in the first place, as those with disciplinary problems that can be attributed to mental illness are now moved to a treatment unit. Contrary to concerns about staff safety, which has been cited as a reason for the use of segregation, Raemisch said that inmate-on-staff assaults are the lowest they have been since 2006. Garcia at Travis County Correctional Complex where Mark is currently awaiting sentencing. In May, Nebraska Gov. Pete Ricketts signed a new law outlawing the use of complete solitary confinement (defined as “an individual cell having solid, soundproof doors and which deprives the inmate of all visual and auditory contact with other persons”) and limiting the use of “restrictive housing” where inmates have fewer than 24 hours of out-of-cell time a week. The legislation also requires the Department of Corrections to compile annual reports on the use of restrictive housing, including how many inmates are released directly from such units. Staff at the federal supermax prison in Florence, Colorado (known as ADX), where all the inmates are in solitary, reported to auditors that they try to avoid releasing prisoners directly, preferring to transfer them to a federal prison closer to their hometown. But Ed Aro, a lawyer who represents Florence inmates in a class-action suit against the Bureau of Prisons, claims that can be misleading. Aro said that the Bureau of Prisons is working on pre-release planning for ADX inmates, particularly for those with mental illnesses. A counselor now works with inmates on pre-release issues, and several longtime ADX inmates have been transferred to lower-security facilities a few months before going home. “While we are very gratified that the BOP is looking at this issue, it remains to be seen how widely these steps will be applied,” Aro said. O n Nov. 24, 2014, Mark left his father’s house around 6 p.m. and walked a few blocks to the Shell station where he often went to buy beer and chips. Mark entered the gas station with a knife and left with $400. Mark had lasted four months outside. He is awaiting trial for armed robbery at the Travis County Correctional Complex. Because of his prior convictions, he faces 25 years to life in prison. Some days, Mark feels hopeful. “I’m trying to change my ways,” he said recently. “I’m trying to learn how to deal with society.” But other times he is not as sure. Three months after he was sent to jail, his uncle, Rene Garcia, joined him. He was arrested for violating his bond on a pending weapons and drug possession charge by not completing a class, and spent three months in jail. While they were both locked up, Sara Garcia scheduled back-to-back visits at the Travis County Correctional Complex every Wednesday, where her 20-minute conversations were conducted through the small television screen of the video visitation system. The audio had a few seconds delay, making conversations halting and full of interruptions. He didn’t have much to report. He spent a lot of his time the way he did when he was in solitary: pacing in his room, listening to his radio. Mark spoke close to the phone and looked down at his lap. He squinted. Garcia’s smile faded. “Really?…Ok, well we’ll talk about that next time,” she said as the timer at the bottom of the screen counted down to zero. Mark stood up to leave. Garcia was left staring at an empty plastic chair. Before he walked away, Mark told her that he missed solitary. He wanted to go back. 1In reporting this story, the Marshall Project contacted corrections departments in all 50 states and the federal Bureau of Prisons to ask what data they collect on the prisoners being released directly from any kind of segregated housing unit into the community. 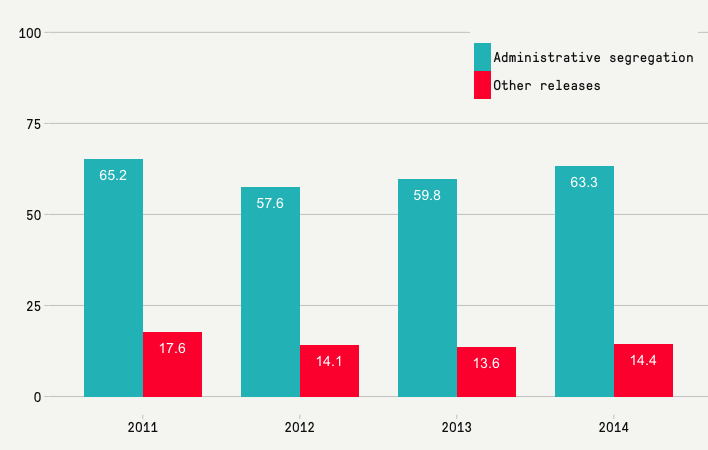 We asked for annual release counts from 2008 through 2014. Twenty-four states provided some kind of data, which we have published here in their original form. The quality and coverage of the data we received varied widely. Some states were able to give numbers for releases from administrative segregation (for prisoners considered to be security threats), disciplinary segregation (for people that violate prison rules), and protective custody (to protect a prisoner from others). Other states could only provide numbers on releases from administrative segregation. Some states count these releases by calendar year and others by their own fiscal year. And several states could provide numbers for only a few of the years requested. Despite compiling data tracking releases from solitary in these 24 states, the inconsistencies of how each state defines solitary and the different time spans provided prevented ranking or comparing them to any significant degree. Journalists: Help give this investigation a local focus. Here are tips on how to use our data to write your own story.